There’s been a few titles that we announced for publication, but then got plagued by a variety of snags which delayed their release. 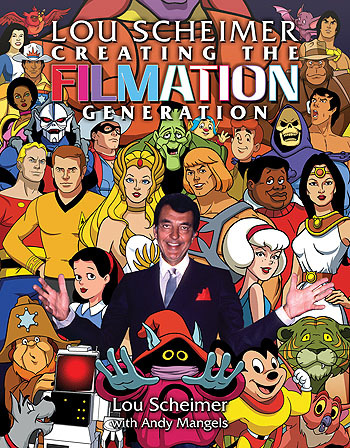 One of the most-delayed was LOU SCHEIMER: CREATING THE FILMATION GENERATION, about the co-founder of Filmation Studios, which produced so many of the cartoons and live shows I grew up on: Archies, Batman, Groovy Ghoulies, Star Trek, Shazam! and Isis, He-Man, and others. 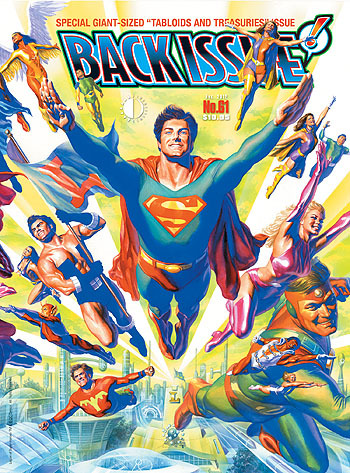 First announced in 2007, not the least of the troubles with this book was the repeated sales of the Filmation rights to new companies, which required new approvals each time. But I’m thrilled to announce that the book is FINALLY printed, on the way here, and will ship November 7. The delay resulted in a much larger book than we originally planned; a whopping 288 pages, with many in color. If you grew up on Lou’s shows, believe me, it’s $29.95 well spent. And don’t be surprised if, like me, you get a little teary-eyed when you read the final chapter. This entry was posted in TNT on 30 October 2012 by Mr. Morrow. 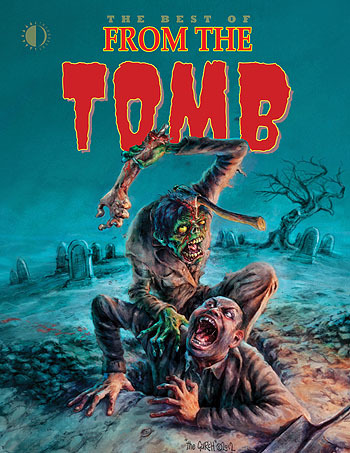 See what we dug up From The Tomb… if you dare! Roy Thomas got into the mix somewhere along the line, having also enjoyed Peter’s mag for a long while, and the idea was tossed around to have TwoMorrows publish From The Tomb here in the US. While that didn’t fit my immediate plans, I did suggest to Peter that we do a “Best of” collection, since most US readers have likely never seen a copy of his mag. So, shipping today is THE BEST OF FROM THE TOMB, a new trade paperback compiling the finest features from the mag’s ten years of terror, along with new material originally scheduled to see publication in the never-published #29. You owe it to yourself to at least check out our free preview, which you can download as a PDF file HERE. And see if you don’t get that same appreciation for Peter’s amazing work that I did! If you enjoy it as much as I do, you can order a copy here for immediate shipment, or ask for it at your local comic book shop on Halloween. This entry was posted in TNT on 22 October 2012 by Mr. Morrow. If you’re in the lobby of the Javits Center, our booth #200 is backed up against the glass wall at the top of the escalators, all the way to the FAR RIGHT SIDE of the convention hall. I mean, it’s literally the last one to the front right corner as you’re going up the escalators. Don’t ask me why we’re there, but hey, it’s easy enough to remember the location, right? So hustle on down and see Eric at our booth, where you can take advantage of 30% off cover price on EVERYTHING, even our newest releases. And be sure to bring him a brownie or ask him if you can get him a sandwich or drink or something. NYCC is a long, tiring show, and he’ll appreciate it! This entry was posted in TNT on 10 October 2012 by Mr. Morrow. 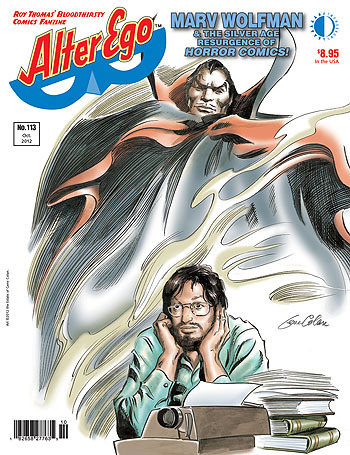 Just in time for Halloween, we’ve received our copies of Roy Thomas’ ALTER EGO #113, spotlighting MARV WOLFMAN’s first 10 years in comics. RICHARD ARNDT talks to Marv about Tomb of Dracula, Teen Titans, Captain Marvel, John Carter, Daredevil, Nova, Batman, and all the other series he worked on. The issue also features a wonderful GENE COLAN cover depicting Marv, plus the usual great features (FCA (Fawcett Collectors of America), MICHAEL T. GILBERT and Mr. Monster’s Comic Crypt, BILL SCHELLY, and more). It’s now shipping from TwoMorrows, and should be in stores next week.